71 years of Independence: How free are we? Top thinkers assess how far India has come, at 71, to give us the freedom to be who we are and the best we can be. Freedom is an idea for which many have died — freedom from slavery, freedom from colonialism, freedom of speech, freedom of religion, freedom to protest, and many others which we often take for granted. On the eve of Independence Day, this issue is devoted to what freedom means for us. On August 15, 1947, 330 million Indians, nearly 13 per cent of the world population at that time, were freed in one of the single-largest emancipations in human history. India formally began its tryst with destiny and, in two years, had located the beating heart of its Constitution in Article 19, which gave its citizens the freedom of speech and expression, to assemble peaceably and without arms, to form associations or unions, to move freely throughout our national territory and, with certain exceptions, to reside and settle in any part of the country. This Constitution-given right, the freedom of speech and expression, is what powers our pens as journalists and allows us to hold to account those in power and authority. The 71st anniversary of our independence is a good time as any other to ask the question: How free are we? It also comes at a time when the state of many of these freedoms is being questioned. The Human Freedom Index (HFI), 2017, prepared by the Cato Institute, a Washington DC-based public policy research organisation, ranks India 102nd out of 159 countries. The HFI uses 79 indicators of personal and economic freedoms - from the rule of law to the freedom to trade internationally — to arrive at its results. Some satisfaction — we're better than China, which holds the 130th position, and we've moved up three places since the 2014 edition of HFI. 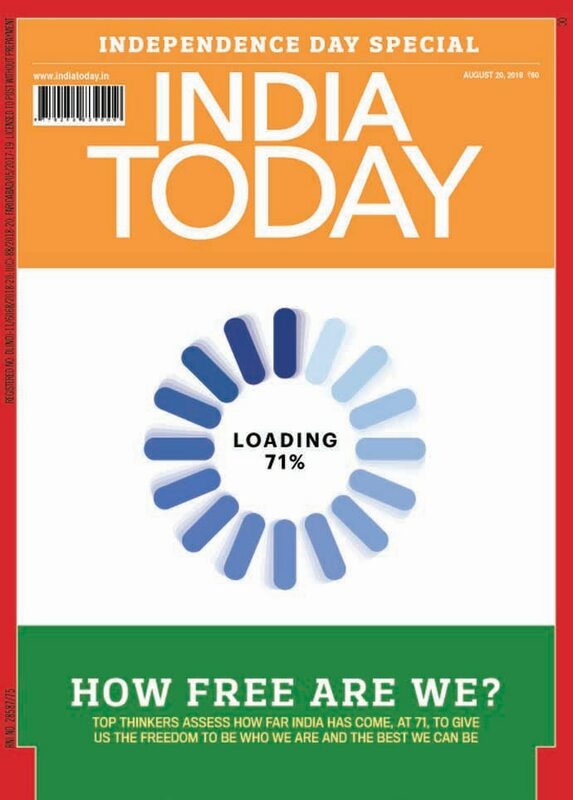 India Today cover story, How Free Are We, for August 20, 2018. Cause for concern too — we have a long way to go before we reach the top quartile. The HFI also reveals an interesting correlation between freedom and prosperity. All the countries in the top quartile of freedom enjoy a significantly higher per capita income — $38,871 — than those in the least free quartile — $10,346. India's per capita income currently is $7,170, even more reason, I think, for the government to step up on its promise of delivering double-digit economic growth. Our Freedom Special, curated by managing editor Kai Friese, features a stellar list of contributors assessing the state of our various freedoms. So Gopalkrishna Gandhi writes on how free Indians are and freedom from fear itself; Robin Jeffrey talks of media freedoms; Nisha Susan examines the freedom to dress and concludes that what women wear is an acknowledgement of the world we live in. There is also Ruchir Joshi who tells us why India needs to free itself from 19th century notions about imbibing alcohol; GK Pillai on why the rule of law needs to be ingrained in every security person; and Arvind Panagariya who has viewed trade freedoms and advocated why we must think through the urge to impose retaliatory tariffs. Elsewhere, Sanjay Rajoura insists on the freedom to offend; Anjali Bhardwaj says that any government serious about fighting corruption and delivering good governance must necessarily strengthen the RTI regime, which provides a decentralised framework for citizens to expose corruption and abuse of power. Nandita Haksar explores freedom, food and the communalisation of cuisine; Abhinav Kumar elaborates on why the state must re-examine the tough laws on narcotics, while Zoya Hasan looks at political freedom and the shrinking space for dissent. Hearteningly, the list of our freedoms is expanding, not contracting. Just last year, the Supreme Court, in a landmark judgment, ruled that the Right to Privacy was an inalienable part of the right to life and personal liberty. A declaration which, as Reetika Khera argues, has given citizens a renewed and powerful line of argument against bad laws and state action. The resilience of the freedoms given to us by our founding fathers will determine the course and trajectory of our Republic. And because eternal vigilance is the price of liberty, we need to be alert over attempts to dilute it. India being a multi-cultural pluralistic secular society will only survive as a nation if our freedoms are not tampered with. That said, we should cherish the freedoms we have, unlike many countries in the world, especially those in our neighbourhood. Enjoy reading this special issue. Wish you all a Happy Independence Day.